*The cépage for this wine is based on Jim Clendenen’s research of the original planting at the Corton Charlemagne Vineyard and is named in homage to Charlemagne’s wife Hildegard. Legend tells us that she was the impetus to this historic “re-planting” of a section of the Grand Cru Corton Vineyard to white varietals. 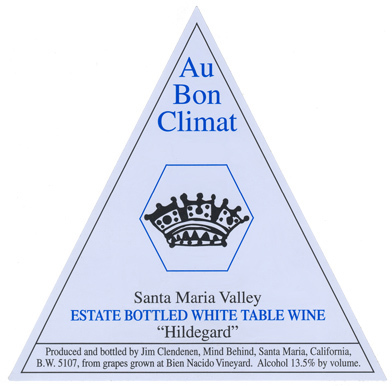 This wine is a blend of Pinot Beurot (a Burgundian clone of Pinot Gris) and Pinot Blanc grown at Bien Nacido Vineyard in plantings developed for Au Bon Climat, as well as Aligote grown at Jim’s own Le Bon Climat Vineyard. “Hildegard” is a recreation of the original planting of the Corton Charlemagne vineyard in 800 A.D. The grapes are hand-picked, whole cluster pressed, and barrel fermented in all new François Freres barrels. Each lot finishes malo-lactic fermentation and is aged sur lie for 2 years. The wine is then racked, blended, lightly fined, and bottled without filtration.